Pemphigoid is an autoimmune disease. This means that your immune system, which normally protects you from infection, begins to attack your healthy tissues. In the case of pemphigoid, your immune system creates antibodies to attack the tissue just below your outer layer of skin. This causes the layers of skin to separate and results in painful blistering. Why the immune system reacts this way in patients with pemphigoid is not fully understood. 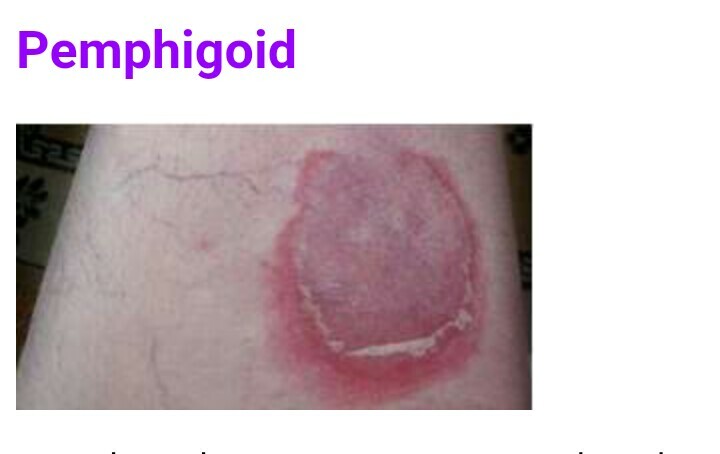 In many cases, there is no specific trigger for pemphigoid. In some instances, however, it may be caused by certain medications, radiation therapy, or ultraviolet light therapy. People with other autoimmune disorders may be at a higher risk for developing pemphigoid. It is much more common in the elderly than in any other group. Pemphigoid cannot be cured, but treatments are usually very successful at relieving symptoms. Corticosteroids, either in pill or topical form, will likely be the first treatment your doctor prescribes. These medications reduce inflammation and can help to heal the blisters and relieve itching. However, they can also cause serious side effects, especially from long-term use, so your doctor will take you off of the corticosteroids after the blistering clears up. Another treatment option is to take medication that suppresses your immune system, often in conjunction with the corticosteroids. Immunosuppressants help, but they also put you at risk for other infections. Certain antibiotics, such as tetracycline, may also be prescribed to reduce inflammation and infection.